September 27th at Raccoon Creek State Park. Another example of why go out in late September to photograph butterflies? Aren’t they ‘done’ for the year? What’s left to see but a few raggedy left-overs from the summer months? Compounding that, goldenrod was just about the only wildflower in bloom. It covered Doak field like a yellow comforter! Obviously I did drive the 36.9 miles. If you’ve already viewed our post of Leonard’s Skipper butterfly, then you know what’s coming. 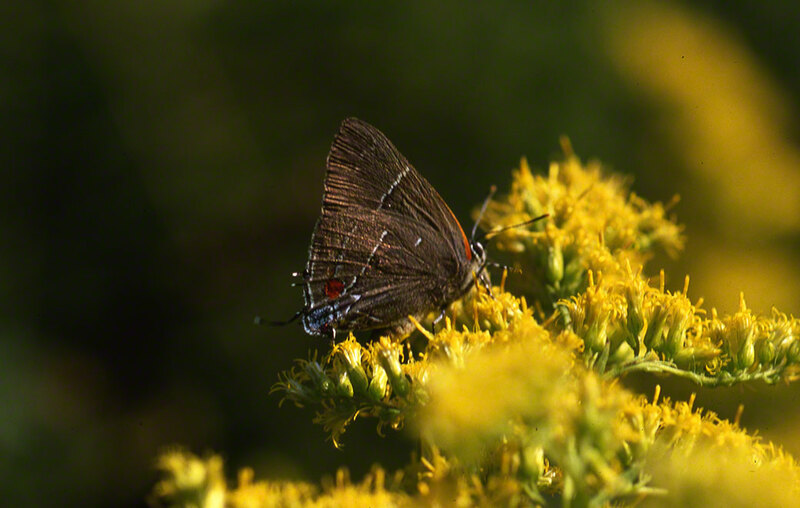 What was it, nectaring on goldenrod at the very edge of a cut trail? It was a little large for hairstreaks, this butterfly was clearly not a Gray, nor a Striped, nor a Banded, nor a Coral. What was this unexpected beauty? Daddah! A White ‘M’ Hairstreak! Parrhasius m-album is an infrequent visitor to western Pennsylvania. So you’ll have to forgive the photograph. I’ve only seen White ‘M’s’ twice in 12 years. Elegant in its usual pose, with wings closed. It is spectacular when it briefly opens those wings. The bright iridescent blue radiates from those wings, as if meant to broadcast out to all. I’ve seen one 2 years later, within several feet of this one. That’s it for my sightings in or about Pittsburgh. This summer has brought reports of Giant Swallowtail sightings in Canada! You just never know.